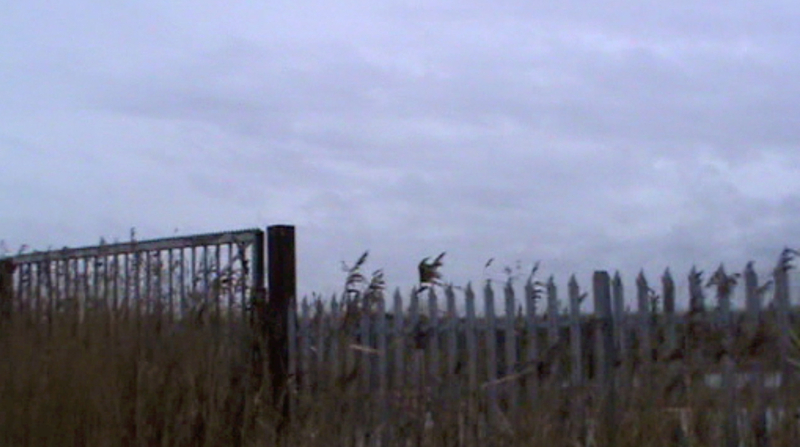 ‘East Wind’ was filmed in the East Riding of Yorkshire, on a strip of land six miles south of the coastal town of Hornsea. The film’s setting is bounded by a MOD training area to the north, a wind farm to the west, East Hill farm to the south, and the North Sea to the east. The title derives from the Dylan Thomas poem ‘Why east wind chills’; three lines in the film (spoken by Emma Bolland) are taken from another Thomas poem, ‘I make this in a warring absence.’ Commissioned for the 2014 Laugharne Castle Poetry and Film Festival. Scripted, shot and edited by Brian Lewis. In a stone bus shelter on the edge of Welwick, halfway along the B1445, a farm dog calls you out of your hiding, and you start to think that it’s the rests, the stops, that are taking it out of you. The pavement is at a standstill. There are faults in the kerb. Weeton lies three miles and two hours east of the new year. The road passes through it, pitted and slow, where a drunk man pauses on the northbound lane. He offers his greetings. You offer your greetings. He swears at your back. There is no traffic. Beyond Skeffling, the road climbs for a mile or so, curving then straightening for the approach to Easington. You are somewhere between the curves and the straights when you hear the vehicle slowing behind you. It pulls to the side. Stop. Stop. I step down from the banked verge and take fourteen or fifteen paces towards the patrol car. The engine falls silent. It is nearly 3am and I have been walking for sixteen hours, with two short, unsuccessful breaks. The driver lowers his window and begins to speak. He wishes me a happy new year. He notes that there are not many people on the roads at this hour. He asks me where I am trying to get to. ‘Spurn Point’, I reply. ‘I’ve just walked from Hull.’ Why are you walking from Hull to Spurn Point, he asks. I haven’t prepared an answer. What will you do when you get there, he asks. ‘Walk back, I suppose.’ I am speaking with difficulty, the voice drying out, falling back into disuse. I manage to ask if there will be any buses later. He turns to his colleague in the passenger seat. After a few minutes, they turn back to me. There will not be any buses later. The engine makes its starting sound and the car fades into Easington. Left of the village is the gas terminal; left of the gas terminal is the coast. The east road ends here. I move awkwardly through the village, wanting signage, black on white, the unnumbered road to Kilnsea, the whites and yellows of the lit terminal flaring and softening in my left eye, shrinking as the road turns from the sea. I am clear of the last outlying cottage before my stride gives way. Set back from the verge is a rough bench, two planks and two posts, and I buckle into it. My arms fold and my head sinks. For perhaps twenty minutes there is nothing, near to nothing; then, from the road south of Easington, a voice starts in, racketing and injured, closing down my half-sleep. As the voice approaches, as my head lifts, I realise that it is the drunk from Weeton: aiming at song, belting it sideways. I cannot make out one word that he throws down. The tune is straying into me and will finish there and I will be caught and made into his companion. The bench holds me. It is arresting me. I will be made into a companion. I haul myself out of the stupor, shoulders first, strapping the bags about me, measuring his pace, sluggish but steady, I have no pace. I try to push myself into a walk. I say that he will not stick to me. I push myself harder, right ankle resisting, something splitting on the left side, then the voice, off balance, off song, weakening its hold, wilting in the gap. The gap moves southward. Sometime after 4am, the road runs into Kilnsea Clays, marked on the map as a low, grey buffer between Holderness and the Humber, neither land nor water. The distance between west bank and east coast has shrivelled to a half-mile, which the road now addresses with a sharp left, leaving me, some minutes later, at a crossroads. I stop and almost immediately lose my position. The few signs I find have been put there for custom: caravans, pubs, private lets. The south might be anywhere. I start back up the road, thinking of the farmer’s silo I’d passed ten minutes earlier, thinking of it now as a place, a place to spend the last hours before dawn. Halfway between the clays and the coast I hear vocals and know that it is the drunk. I turn back to the crossroads and lose my position again, this time at the caravans. The intervals between song are lengthening and I have no sense of the drunk’s direction. I go further into the caravans. A patrol car idles at the crossroads. It seems to be the patrol car from Easington. I do not see or hear it approach. The song dies down. The patrol car leaves. On coming forward from the caravans I see the sign for Spurn Point. I follow the road south, land narrowing and flattening on both sides, half-lit by an unclouded moon. I don’t want it. The idea is smaller and smaller with each step. Here and there the old railway breaks into the road, the track slanting the concrete, surfacing from grass on the east embankment, tapering into sand on the westward tilt. Every few hundred yards a passing place or a sketched-out car park. Every half hour a car, bound for the lifeboat station; then silence folds over the spit, its concrete, marram and sand. Bits of Flamborough, forty miles north of here, hang somewhere to my left, silent, unshown, sent down as longshore drift; rounding the spithead, drawn into shelter, worked into silt. On a slight rise, just short of the lifeboat buildings, the shell of a functional one-storey structure, square, stone, solitary. I walk into its one room, floor lost under layers of chipped wood, broken brick and MDF, and look to make myself comfortable. Wind pans from doorframe to windowframe. I have settled myself on the remains of a panel, knees brought to chest, waiting for the collapse: for sleep, portioned out in scraps. It doesn’t come and at 6.30am I abandon the room. I make a diagonal from the lifeboat buildings to the landward jetty, tracking the lights that count it into the water, still dark and sheer, no word of morning. The jetty is gated and locked. I step back from the spithead’s edge and blink back the movement in the lifeboat buildings, two persons, paused in office and kitchen, the start or the end of a shift. Between the pilot station and the parked cars is a bird hide, built of brick, listing slightly in a grass pitch. I walk to it and find a single mattress set into its middle, raised from the concrete floor by an uneven spread of debris. I fall upon it, fold my arms into a pillow and sleep. Towards 8am I wake and leave the hide. It is full morning, blue above the estuary, wind hardly stirring the grass. There seem to be more vehicles in the car park and more arriving. My legs are not working properly. I tell myself that today will be easier, clear skies, a simple aim, a simple route. I haul myself up the peninsula and try to fill in the blanks from last night, the landscape’s span and detail halved by darkness and exhaustion. I look out at the estuary and see only more blanks. The road ahead is heavier than I remembered. The lighthouse. Blown dunes. Repeats of cars. After two hours and four miles I reach Kilnsea. There is a bench set close to a dry stone wall. I sit down, take in some water; a few minutes later, I am clean out. North of Easington is where the imagery starts to break down. I have been standing at the edge of the B1445 for fifteen minutes with my thumb pointing skywards. This has no effect on the cars. I am unable to maintain the position and turn away, upper body stiff with chill, legs seizing, bending then seizing. The road stretches west and I move back into it. It is midday. Six miles to Patrington. Another sixteen miles to Hull. A familiar stress in the toes of my right foot. Cold chafing. Sapping fever. Where the B1445 runs out east of Patrington, just short of Black Mill Farm, you find a slate plaque on a square stone plinth. Zero longitude. Three markers lie north of here, west and north-west of Withernsea, the last of these lost to tidal erosion. Then nothing, the meridian out of land, only water marking a line between here and the polar ice, grid north from true north. A housing estate, Patrington, 3pm. I lower myself to a concrete bench. It slopes towards the road and I don’t know what to do with my legs. The stops are now more and more frequent. I no longer know what I am stopping for. Each stop leaves me with less and less to go on with. The map breaks down when I try to read it. I have little food and no appetite. I brace my hips against the bench and find that my lower body has locked. Hull train station is sixteen miles from here. My train leaves in five hours. Currently my walking pace is two miles per hour and falling. There are no buses. No taxis. My phone is lifeless. I try to measure this information and myself against it. I want the sleep knocked out of me but don’t know where to start. I think of unfreezing my body, joint by joint. The first joint loosens slightly and I begin to pull myself upright. This won’t hold out for long. I move towards the village and push myself towards the exit. I am somewhere west of Keyingham when the afternoon light cuts out. The last three signs, widely spaced, have all given my position as nine miles from Hull. I look up only for this and for oncoming traffic. At Thorngumbald I cross the road to a bus shelter and slump against the perspex. I spend the next ten minutes caught between broken starts, eyes twitching, head lolling. I have to come out of this. I recross the road where I left off, slowing still, night settling around the village, the edges showing through. The plain, emptying towards the south-west, the city creeping into it; the road branching, widening, taking on weight. I miss my turn at Hedon, its crossroads skewed and dim, and find myself two miles north of the dual carriageway. I take the first left, a thin country lane, out of place now, curving west to south, the fixed points of the city further off. I join the carriageway at the Saltend flyover and pick my way through the crossings until I reach the broad pavement, westbound against the eastbound traffic. Above me, every half mile, directional signs, intersections with four or five arms, traffic filing out to docks and estates. I try to imagine that I am part of this flow into the city. I stop to take my position from the signage. I cannot read the destinations. The lettering is not doubled. I can make out the shapes on the boards and match them to the system around me but I cannot read the destinations. The lettering is not blurred. I try again, stock still and squinting, and eventually make out some words in the upper left of the sign, the marina, the aquarium, and move on before it starts to hurt again. In the city centre you ask for the train station. You ask three times. You move south, north, west across the city, losing your place. Then the carriage, emptying and emptying, stop after stop. Eastings concludes the journey outlined by Brian Lewis in the closing sections of The Meridian (May 2013). The Marker, a sequence of short poems tracing the river path from Hull to the Sunk Island Meridian (the thread of which Eastings picks up), can be found here. The medical student Philippe Tissié recalling an early encounter with a patient, Albert Dadas, in his doctoral dissertation (Les aliénés voyageurs, 1887). Albert was a gas-fitter from Bordeaux who, following the publication of Tissié’s thesis, became known as the first fugueur; as reports of his obsessive journeying spread throughout Europe, so did diagnoses of fugue, which ramified outward from Bordeaux to Paris, then all of France, Italy, Germany and Russia. By the end of the 19th century, it had acquired the status of a minor epidemic. As Ian Hacking notes in Mad Travellers: Reflections on the Reality of Transient Mental Illnesses, fugue, which also came to be known as Wandertrieb, automatisme ambulatoire, and dromomania, had existed for centuries; however, it was the publication of Tissié’s thesis that positioned it as a discrete mental illness. In early 2000, I began a series of walks, each one taking London as its starting point. I would arrive in the city at dawn, alone, and spend the next twelve hours in districts largely unfamiliar to me, photographing scaffolding and street furniture. The making of images was, at first, the principal reason for the walks; the walks were simply the means by which the images were achieved. Though the days with the camera were long, the miles were relatively few; the city’s densities, its pockets of complexity, are best documented at close range, and I proceeded slowly, street by street. The other, unspoken, reason for the walks was the wearing down, or out, of anxieties that had built up over the winter months. Framing and focusing the city through a lens offered a trance-like detachment; distance and immersion, absence and engagement. Over the next few years, the walks took me further and further away from London (though usually with London as the point of departure), always bearing east, and lengthening in range. Sheerness, Canvey, the Isle of Grain. By 2005, the making of images was secondary to the expedition, which would often stretch to two or three days, with two or three hours’ sleep snatched in a bin liner. Invariably, the first few hours of the walk would give the camera its stimulus, whether the location was urban or rural; the work done, a blankness would settle on the walk, its purpose forgotten, a thinning out of thoughts to distance and weather, the body working itself deeper into its own fatigue. The internal disquiet that framed the journey at its start was exchanged for more urgent concerns: water, food, shelter. The provisions always scant, the gear inadequate and grief-giving, the pain enduring for days after. After coming to rest, I would resolve never to put myself through it again. Then, when several months had passed, the scars fading, I would lace up my leaking boots, pack the waterproofs that weren’t, and set off. Ian Hacking contends that the diagnosis of fugue was made possible by several phenomena (or ‘vectors’) that comprised the ‘ecological niche’ in which it thrived. One of these vectors is cultural polarity: Hacking argues that the place of fugue was somewhere between the contemporary phenomena of ‘romantic tourism and criminal vagrancy’. Another vector is release. According to Hacking, fugueurs were almost exclusively drawn from the urban working poor. Fugue offered ‘a space in which dysfunctional men, on the edge of freedom, yet trapped, could escape.’ Trauma and obsession distinguish this mode of walking from the merely touristic (and the merely vagrant), of course, and, for Tissié and his colleagues, marked it out as a clinical state. Are there parallels between the compulsive walking addressed by Hacking – movement through landscape impelled by trauma – and a practice of immersive walking – movement through landscape impelled towards trauma? East of the city is flatness, emptiness, exposure. It’s here that the waste is carried, miles below the suburbs, through the pumping stations and outfall sewers; here the marsh flats, the rifle ranges, a peninsula cross-hatched with fleets and creeks. I remember the causeway at Grain, a broken line to the military tower, half-lit from the horizon, half-sunk beneath the tide, thirty miles down, another forty to go, skin crisped, feet skewed, the embankment drawing back to a damp pill-box that someone, out here, beyond the settlements, had taken for a shelter. I remember the smoke hanging at the mouth of the pill-box, the small fire inside, the shuffle and twitch of whoever was stoking it. 3am. An hour’s bad sleep on a roll of carpet salvaged from the power station’s perimeter ditch. The water almost gone, the route unclear. Offshore, the tower, patchworked from concrete, stone and brick; leaning into it, a barrack on stilts. In A Philosophical Enquiry into the Sublime and Beautiful, Edmund Burke puts forward the idea that the sublime is that which has the power to compel and destroy us. Burke qualifies his argument by acknowledging the distance from the sources of the sublime – pain and terror – that one must necessarily maintain in order to appreciate its effects. Here, the ideas of danger and fear are sufficient to excite and compel the imagination. Their pressures are keen, but moderated. In this way, the sublime ‘anticipates our reasonings, and hurries us on by an irresistible force.’ And yet, Burke also contends that fear, which is no more than the idea of pain, ‘effectively robs the mind of all its powers of acting and reasoning’. The sublime, then, both impels and paralyses. It is possible to argue that a disconnect of mind from body occurs when this state is prolonged; the body hastening, the mind seizing. The sublime object maintains its distance, unchanged by the journeying. My walks drifted northwards, still moving through the eastern counties, the eroding coastlines of Essex and Suffolk. In a vandalized boathouse on Aldeburgh beach I wake to night cramps, shaking teeth, tightening skull. It is 11pm on the second day of my walk and I have been dozing fitfully in a white plastic chair since 9.30pm. I attempt to light the room with the feeble torch on my phone. The interior of the boathouse looks like the set of a cheap horror film. I cannot make sense of anything around me, or how I have come to find myself here. Pain is rearing up from all sides. I begin to wonder whether something terrible has happened – to me, to the room. Skull and teeth ache from convulsions. I pick my way over the broken glass, through the dark debris, and out towards the coastal path. Burke argues for the role of obscurity and uncertainty in constructing the sublime, and identifies night as the means by which this is most effectively achieved: ‘When we know the full extent of any danger, when we can accustom our eyes to it, a great deal of the apprehension vanishes. Every one will be sensible of this, who considers how greatly night adds to our dread, in all cases of danger…’ The bounds, the features, the distances of a landscape cannot be perceived with any certainty, or with any measure of safety, when full darkness is upon it. East of the city is flatness, emptiness, exposure. Beyond the sheer concrete sides and chain-link bridges of Associated British Ports and the twinkling maze of Saltend Chemicals Park is a thinning embankment marking a line where the Holderness peninsula meets the Humber. It is New Year’s Eve and I am walking from Hull to Spurn Point, a sand spit formed of longshore drift, washed down the coast from Flamborough Head. My cold has been worsening for three days. My sleep has been poor. The weather has moved against me. Scribbled on a travel receipt and creased inside my breast pocket is an idea of the city and the plain that I am keen to make use of before it expires. Southeast of the village of Paull, light draining from field and sky, I reach the plain. An impassable channel forces me inland and I am turned halfway to Thorngumbald, a fierce, unexpected shower infusing my unproofed cagoule and aged boots. At Oxgoddes Farm I turn back to the river, or what I think is the river, something not myself pulling through hedges, over creeks and barbed fences, seeking the bird’s flight to the water. I pull through two, three more fields, each more obstacled than the last, each seeming to take me further from my course, and find the embankment. To my left, the dark plain of Sunk Island; to my right, across the river, lie Immingham and Grimsby, the smoke and dazzle of their night industry. I push on, wind and drizzle thickening, making what little there is to see and hear less visible, less audible, driving into me, driving my thoughts further inward, this body onward, the path cut down to two or three jagged paces, no thoughts of the journey before or behind me. After two hours, the wind softens, the clouds scatter. I lift my head and look around me, left to right. To my left, the dark plain of Sunk Island; to my right, Immingham and Grimsby, the perspective unaltered. I do not appear to have made any progress. I tell myself that I have been moving steadily at three to four miles per hour and yet my relationship to the landscape is unchanged. There is no signage, no lighting, nothing to read and nothing with which to read. There are no benches, no rest stops. My throat is sore. I continue on the path, the outlook unmovable, a burst football appears, I shunt it forward with my right foot, keeping its pace, a few hundred yards it lasts, then rolls into a ditch. I continue on the path, the outlook unmovable. Another hour passes. Towards 10pm I notice a squat shape on the path ahead of me. I walk towards it. It is the Sunk Island Meridian Marker. The obelisk allows just enough space between the marker and the base for me to seat myself. I slump against it. Half a mile east of the Meridian runs Patrington Channel, its course passing through Skeffling Clays and into the Humber. There is no way across. I head north, through farmland and rough tracks, to Patrington itself, the lit spire of the parish church guiding me from lane to lane. I reach the village and am immediately possessed by the notion that it cannot provide for me, cannot offer refuge. I near a pub on the south side of the village. It is after 11pm. People are crowding the entrance and greeting each other. I cannot go in. I move to the side of the village and look for unsecured outbuildings. I trip the security light in a farmer’s yard and flee. East. An unfinished extension, a loaded skip, a pile of breezeblocks. I make as if to hide myself amongst them but am seen. East. To the cricket ground, its clubhouse fastened against winter, I try its locks, then the toilets, one disused, I force the bracket and it gives, I fall inside, no lights, no plumbing, I slide against the wall and fall forward, resting now, I have nothing for the fever. For half an hour I rock back and forth. The church tower rings for midnight. The damp rises through my feet. I cannot stay here. I gather my things and slap myself awake. The wind has returned to the village, banging the unlatched gates on their hinges, showing me the way out. East. The Meridian was among the papers presented at the Occursus symposium on Post-Traumatic Landscapes at CADS, Sheffield, Wed 22 May 2013 (click here for the full programme). The account of the walk from Hull to Spurn Point (and back) is concluded in Eastings (click here to read it). Burke, Edmund. 1757. A Philosophical Enquiry into the Sublime and Beautiful. Ed. Womersley, David. 2004. London: Penguin. Hacking, Ian. 1999. Mad Travellers: Reflections on the Reality of Transient Mental Illnesses. London: Free Association. A thinning track, scuffed back to dirt by a dust storm, the dust smudging the outline of an emergency hut: heavy timbers, steep-pitched roof, two iron-strapped doors outgrowing their frames. Inside, four bare wooden berths, chained to broad rafters, close the corners of the hut; at its centre, the ceiling gives way to an unfurnished loft grounded by a ladder. A card-table, stuck with the leavings of smokers, drinkers, diners, squares up to a four-pane window, the window dividing the moor, the lake, the track. The visitors’ book, still tight in its binding, holds entries from 1997 to 2003, most dating from summer weeks, the lines brief. Bottles – glass and plastic, upright and fallen – store ash, gum, wax. A low narrow bench has been drawn against the front legs of the table, making a window seat; the window showing what it can of the track, its own dust breaking with that of the moor, the lake sinking its light between them. I am leaning into a binliner that has filled out with spent fibre wad cartridges and rain. 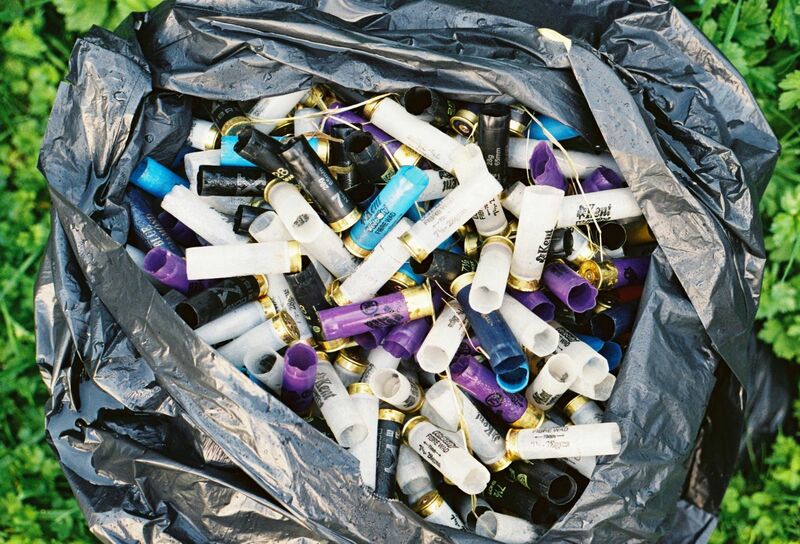 The cartridges are Kent Velocity: white, blue, purple, black. The rain is between three and five days old. The rain has been working on the cartridges, quiet and impartial, drawing thin blotches of rust from the brass base into the plastic casing, a temporary finish, the discoloration rubs and then washes out if I set my thumb to it, the plastics returning to white, blue, purple, black. I turn away from the binliner and look around for my rucksack. It is lying at the bottom of a short run of concrete steps set into a grass embankment. I walk the small distance to the rucksack and go through it for carrier bags and I take one, a spare one, out of the surplus. It is from Sainsburys. I walk back to the binliner and start in on the top layer of fibre wad cartridges, separating them by colour, inspecting them for flaws, transferring six of each to the carrier bag. I make a loose knot of the handles and stow the bag inside the rucksack. A few yards behind the binliner is a small breezeblock store, six feet by twenty feet, windowless, shuttered and padlocked. Here and there the grey of the shutters is broken up with long streaks of green paint, the glancing sunlight dulled where it meets, flat metal horizon. The paint is not deliberate. Three paving slabs, loose and irregular on a base of gravel, have caught the run-off; the paint finds each chip and cleft in the concrete. I hear movement. I turn round and find nothing, only the space between the store and the concrete steps, the little that is in it; the full binliner, my rucksack, and three rusted, perforated drums congested with nettles and weeds. The field is emptied out and crammed to an edge. There is something else, further off, an intermodal container stranded some fifty feet from the field end, blood red and rust red, corrugated sides, illegible graffito part-masking the stencilled registration at the rear. I cannot see a way in. Past the container, the field clears to a soft boundary of tree and hedge that leads nowhere. Neither the field nor the container seem to be attached to anything. No signposts or proprietorial warnings. I turn back to the store and realise that I do not have any directions. I open my rucksack and find that my map has filled with leftover rain, leaked from the carrier bag in which I had concealed the spent fibre wad cartridges. The map straightens out and eventually shows me how to leave the field. I walk up the concrete steps and into the unfinished landscape. I attempted to gain access to Orford Ness while walking in Suffolk last summer. The attempt consisted of prolonged staring at the southern tip of the Ness from my precarious vantage on the marshes north of Shingle Street, the two masses separated by a wide river raging at 40mph. I thought I would swim across this in the buff, my things stowed in a binliner and towed with one arm, thus saving an 18-mile detour through the county. I looked at the river. I looked at the marshes filling up with dusk. I chose the 18-mile detour instead. Felixstowe to Lowestoft took almost 3 days, during which time I enjoyed a total of 4 hours’ sleep. 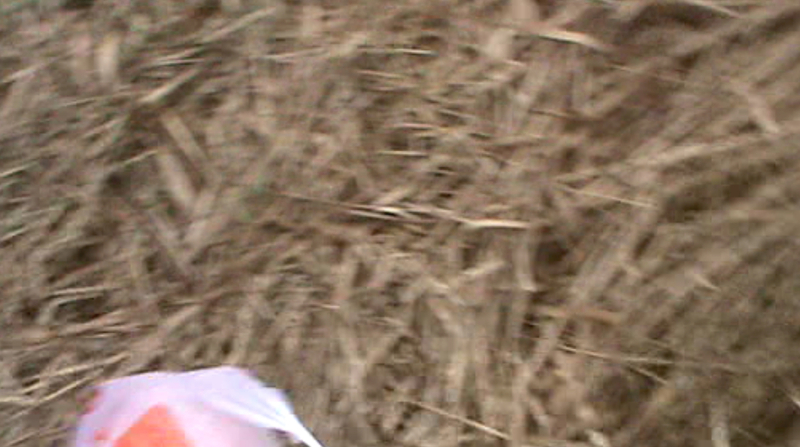 On the first night, I slept between two bales of hay in a field, wearing a pair of perforated binliners. This was unsatisfactory. On the second night I slept in a vandalised boathouse – windows smashed, doors torn off, glass and debris everywhere. This was also unsatisfactory. The other options were: a) an Edwardian promenade shelter, exposed to the wind and rain; b) folding myself underneath a bench; c) burrowing into wet sand. At least the boathouse would offer some protection from the elements. I settled down in the white plastic chair and pulled a stiff roll of discarded carpet towards me. It was 9.30pm. I woke towards 11pm, half-paralysed with cold, cramps, black fear. I lit the room with the feeble torch on my phone. The interior of the boathouse looked like the set of a cheap horror film. I couldn’t make sense of anything in the room, or how I had come to find myself there. Pain rearing up from all sides. I began to wonder whether something terrible had happened – to me, to the room. I tried to sleep again, dozing for 5 or 10 minutes; I abandoned the effort sometime around midnight, skull and teeth aching from convulsions, and made my way out towards the coastal path. The wind and rain hadn’t let up, but, after a few miles’ walking, I felt some heat return to my chest and legs. Three hours (and several wrong turns) later: the sudden bulk of Sizewell B ghosted by drizzle and wind. Walking at night in the country or on the coast is markedly different to walking in the city, there being fewer light sources in sparsely populated areas. The denominator common to all ‘night walking’, though, is the effect on the landscape; the paring down to mass and outline. The coast and country are plunged almost into unknowability (heightened by my unfamiliarity with the territory). The navigation disappears in the dark. I ended up half-lost in a nature reserve. Lowestoft has the appearance of a town that has mislaid something essential to its workings. The train station cannot be found. It does not want to be found. Even the gulls look depressed. I arrive in the ‘town centre’ at 4.59pm. I look for food. The town shuts up shop at 5 on the dot. Apart from Dr Leng, who treats Mans Problem and Internal Problem. And McDonalds. I don’t go in. Instead, I wander through the dead mall, empty but for the odd gull racing into the atrium. I look for food. I go to the pier. There is a man called Den who vends chips and pies. I ask for a cheeseburger. I don’t know why. I have not eaten a cheeseburger in over 10 years. It seems exotic. Den prepares the cheeseburger with care, slowly peeling the processed cheese slice away from the compressed stack, turning the burger at regular intervals. After 20 minutes, his work is done, and he passes me the cheeseburger. We exchange pleasantries, and I walk to the seafront, taking a bench with a view of some gulls moping on a rock. I eat the cheeseburger, my first hot meal in three days. It tastes neither of cheese nor of burger.